Anderson, Joe Root and Stuart Broad were involved in a tense discussion with umpires Sundaram Ravi and Kumar Dharmasena on the morning of day four of the fourth Ashes Test. Ravi later had a long chat with Root following the morning drinks break. The discussions centred on the fact Root and many teammates had failed to return the ball on the full to keeper Jonny Bairstow. Bounce returns are a tactic used to scuff one side of the ball and make it go reverse. The practice of using the abrasive centre-wicket block to help rough up one side of the ball is frowned upon but widely used. Footage also emerged of Anderson working on the ball with his thumb. 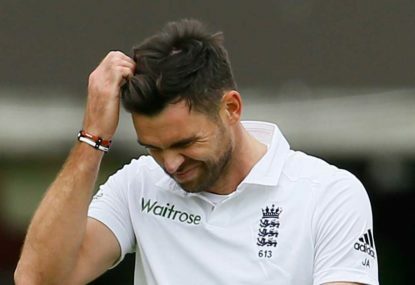 “There might be a little bit of a ‘please explain’ there for Jimmy Anderson,” Hussey told cricket.com.au. “I know there’s a lot of tactics but there’s a bit of a line there that you shouldn’t cross in picking the seam of the ball and things like that. “The English have been throwing the ball into the ground to try and scuff one side up. That’s nothing the Aussies weren’t doing either and the umpires are generally on top of that pretty quickly. Shane Warne an Michael Slater both suggested Anderson erred but stopped short of levelling any allegations. “They got the ball to reverse pretty quickly,” Warne told the Nine Network. “One thing you want to make sure you do, when you do anything to the ball besides shining it, is make sure you go to the umpire (and show him what you want to do). Slater, sitting alongside Warne, noted “it wasn’t a scrape but a nail on the leather which is a no-no”. In addition to bounce returns, the tourists also regularly attempted to throw down the stumps on day four even when there was no hope of a run-out. Former Test paceman Mitchell Johnson tweeted during Friday’s morning session that the ball was “reversing under 10 overs”. “No problem with the ball being thrown at the stumps by both teams as long as that’s all it is! Wouldn’t have thought the ball could reverse so quickly,” Johnson posted.